1. I am still a bit flummoxed by Twitter. Even though my 13 year old, steeped in social media, too cool for mom, son will not accept my request to follow him and will not follow me. Me: Why can't I follow you? Me: Are you posting stuff you don't want me to see? Son: Yes. I mean, no. Nothing inappropriate. It's just... Really, Mom. It's just not ok for your mom to follow you. Me: Okay, I get that. Why won't you follow me? Me: You just don't want to see my teacher crap while you're looking at all the cool stuff your friends post. Son: Yes. No. I mean... You know, kids don't really say 'cool' anymore, Mom. Me: What do they say? Son: I don't know. Are we done? But, I digress into the mysterious and inexplicable world of a teenager. Back to Instagram. I love Instagram. It's like Facebook without the drama. Pictures everywhere to feed my short, summer attention span. Little peeks into other people's lives which either make me feel either incredibly inferior or greatly relieved when I look back into my own life. Another time sucking internet hole. I love instagram! So I thought I would do a photo-a-day challenge to sort of jump into Instagram and get my feet wet. But my 'cool' media specialist son says it's dumb and annoying I am a complete dork for doing it. Well, I don't care! I will revel in my dorkiness! And I will take pictures of odd, random stuff for a month! I will post it and hashtag it! And I will join in solidarity with all the other moms of teens in the time honored tradition of embarrassing our children by doing 'mom stuff!" 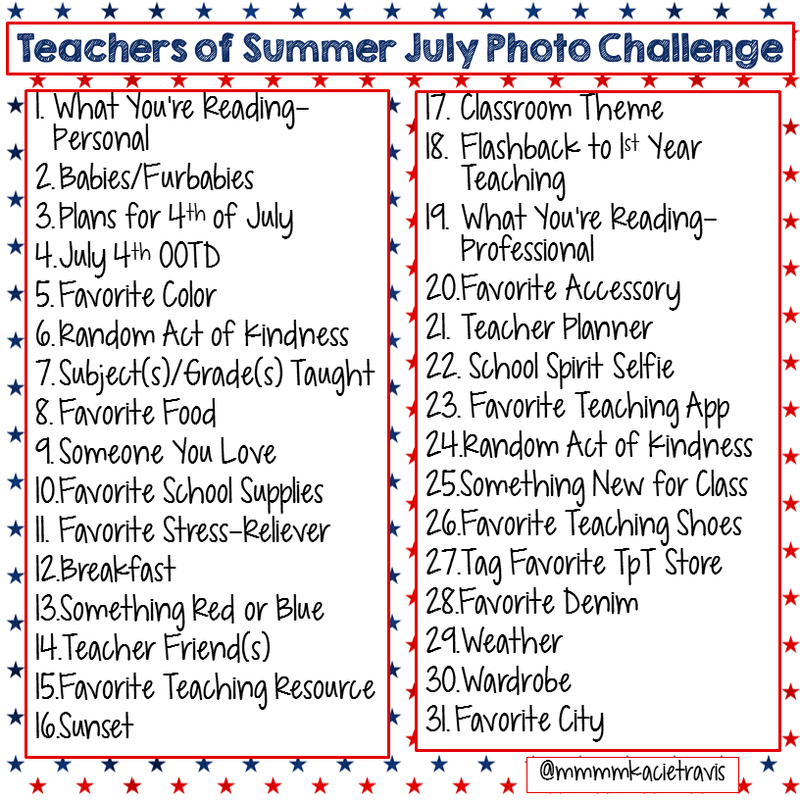 Check out my summer teachery photo stuff and join in! And leave your instagram link in the comments so I can follow you! I am so glad you posted this. I have had a personal instagram, but just yesterday I started one for educated related. This will be a great way to jump in. I also created one on twitter...I hear it is the best Prof Dev out there..haven't figured that out yet! I just can't get a handle on Twitter yet:/ The chat thing thoroughly confuses me! Well, I'm joining in on it! I'm with you on not being a fan of Twitter though. Your convo made me laugh! I did a live twitter chat the other night using #teacherfriends. I'm very good with tech and i was dumbfounded by how hard it was to keep up. it was like having 5 different convos at the same time in the same room. it would be awesome for older kids to discuss books, etc.